The estate of Fontanili lies in an area called Maremma, a lesser known and therefore all the more captivating part of Tuscany extending south towards Latium. It is a region which conjures up memories of foregone times, a world of large estates, generations of old families, harvests, summers and the sea. One is almost tempted to believe that this untamed landscape owes its mystique to the lingering presence of the Etruscans, an ancient civilisation remembered for their peace-loving and hedonistic way of life who lived and farmed here centuries before Christ. 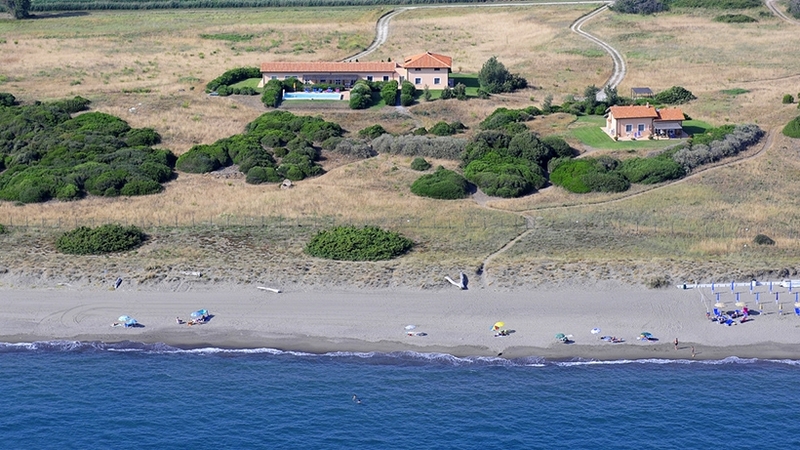 Over the past fifteen years the area has become a favourite spot for a certain Italian intellectual elite seeking the charm of the Tuscan way of life enriched by the joys of an unspoilt seaside. A wide strip of fertile land separates the sea from the mountains. 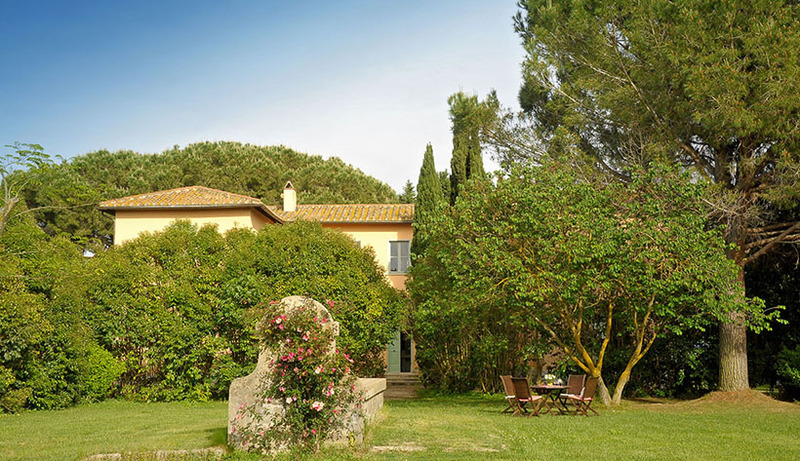 It is here that the house Fontanili stands, surrounded by trees and a charming garden. The estate extends over 260 hectares of olive groves and sunflower-fields. On the map you will find it roughly half-way between Rome and Grosseto, surrounded by the cultural landmarks of Tarquinia, Tuscania, Orbetello and Viterbo, which all are more or less half an hour‘s drive away. The estate is managed by the owner Verio Piroddi, descendant of the princely family Ludovisi Boncompagni, who was awarded the property in 1870 by the Pope in order to avoid confiscation by the newly unified Italian Monarchy. The estate of Fontanili used to cover the vast area of 4.600 hectares until the agrarian reform in 1953 redimensioned the property, redistributing the expropriated land to the former peasants of the property. The estate employs three farmers who live in the vicinity. The ascent of the Boncompagni Ludovisi family goes back to Ugo Boncompagni, a brilliant lawyer from Bologna who represented the Vatican at the Council of Trent and was elected Pope in 1572, taking the name of Gregory XIII. He is remembered as thoroughly imbued with the cosciousness of the great responsability of his position, combatting all ecclesiastical abuses and appointing one day a week for a public audience during which everyone had access to him. The gregorian calender which we use today goes back to Gregory XIII. The nearest village, Pescia Romana, is 4 km. away from Fontanili. Here you will find all you need, baker and butcher as well as a supermarket and, of course, a bar for your daily cappuccinos and a newsagent who also sells foreign newspapers. 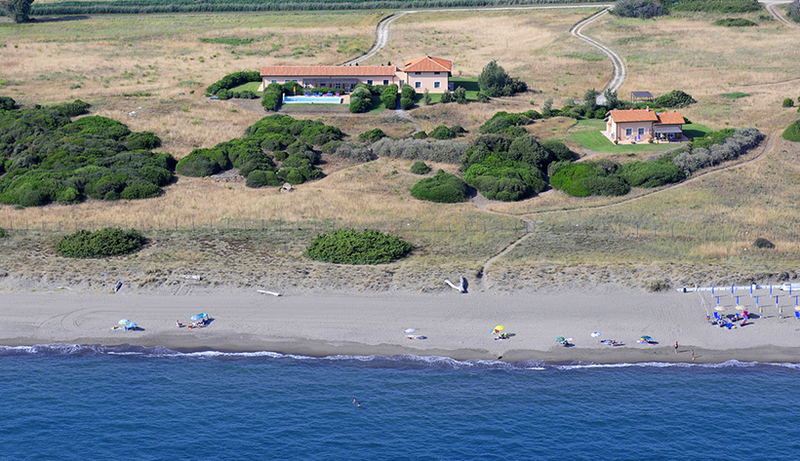 From a holidayer‘s point of view the private beach of Fontanili is a real asset, only four kilometers from the house. A back road leads to a private gate to which the guests are given a key. The beach is of fine sand with a multitude of coloured shells. Behind the beach, the dunes are covered with a labyrinth of wild aromatic bushes such as myrtle and cistus-roses which blossom at different times of the year. Two cafés down the beach have coffé, ice-cream and also serves light meals. Lake Burano: the estate of Fontainili borders on the Lake Burano, a lagoon run by the WWF. The bird-watching here is excellent, above all in spring and autumn. The Parco dell’Uccellina, officially the Parco Nazionale Maremmano, is a rewarding place for nature lovers. Marked footpaths will lead you through incredibly beautiful pine woods to hidden creeks, past romantic ruins of fortified watch towers to the abbey of San Rabano, built by monks who arrived from Rhodes in the X century. Vulci is another natural park of the WWF. The castle called “Castello dell’Abbadia” has become the National Archeological Museum of Vulci with a beautiful collection of ceramics, sculptures and bronzes. We recommend a walk over the Roman bridge of l’Abbadia. From here, on foot or by car, you may reach the remains of the Etruscan and Roman town of Vulci called “La Civita”. The area has become an archeological park and offers a choice of many walks. Tarquinia is world famous for its Etruscan tombs and frescoes. The necropolis of Tarquinia is on the outskirts of town and easy to find. In town the beautiful 15th century Palazzo Vitelleschi is now the Archeological Museum. Tuscania: dating back to the Etruscan period, it became an important fortification in the middle-ages. The two romanic churches of Santa Maria Maggiore are remarkable. A walk through the center of the town is rewarding. Monte Argentario: only half an hour from Fontanile lies the Monte Argentario, a peninsula connected with the mainland by three dams. The Monte Argentario is known for its fine coastline, rich mediterranean vegetation and the two jet set harbours Porto Ercole and Porto Santo Stefano. The Tarot-Garden of Niki de Saint-Phalle: on one of the hills not far from Fontanili the famous french artist hs built her „Jardin des Tarots“, twenty two giant sculptures inspired by the figures of the magic tarot cards. Children love it! Palazzo Farnese in Caprarola, one of Italy’s most stunning Renaissance buildings. The Scala Regia is an elaborate stone spiral staircase that let Cardinal Alessandro Farnese (later Pope Paul III) reach the bedrooms on horseback. The Palazzo contains masterpieces by some of the most important painters and architects of the period. Sovana, Sorano and Pitigliano are three towns at 1 h drive. Sovana boasts a magnificent Etruscan necropolis and 2 remarkable Romanic churches. Pitigliano is a medieval town high up on a crest, with a Jewish community dating back to the 16th c. It is also known for the white wine Bianco di Pitigliano. The Medieval town of Sorano spreads at the foot of the 14th century Orsini Castle. Main feature of the Maremma is… the thermal wind, from April to September the wind blows 4 to 5 days a week with an intensity ranging from 12 to 25 knots, The beaches of Castiglione, Talamone and Capalbio provide suitable spots for any kind of wind condition, where you can practice FreeStyle, Waveriding and long downwind. The tennis club in Pescia Romana, the village, has several courts whcih can be booked by the hour. Golf:there are two golf courses in the region. http://www.termedisaturnia.it/en/golf 1 hour by car, has 18 holes, Par 72. The famous Punta Ala Club is 1 hour by car, it has 18 holes, Par 72. The islands and hiring a boat: In Porto Santo Stefano, 30 minutes drive from Fontanile, you can hire boat which will take you to te islands of Giglio and Giannutri off the Tuscan coast. Giglio has a charming main village and castle, and many creeks hidden between the cliffs. Giannutri, its bare coastline dominated by the ruins of a Roman villa overlooking the sea, recalls some of the Greek islands, which deep-sea divers can look for sunken Roman galeons on the sea bed.